Bhikan Shah was a well known Muslim saint. He was very devoted and honest. Everyone respected him. 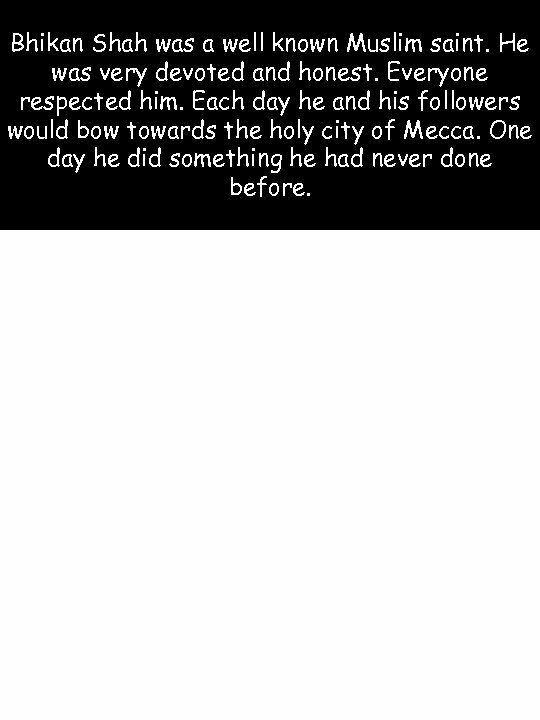 Each day he and his followers would bow towards the holy city of Mecca. One day he did something he had never done before. He started bowing in the opposite direction of Mecca! His students and followers were surprised! They thought, “Is he going senile? 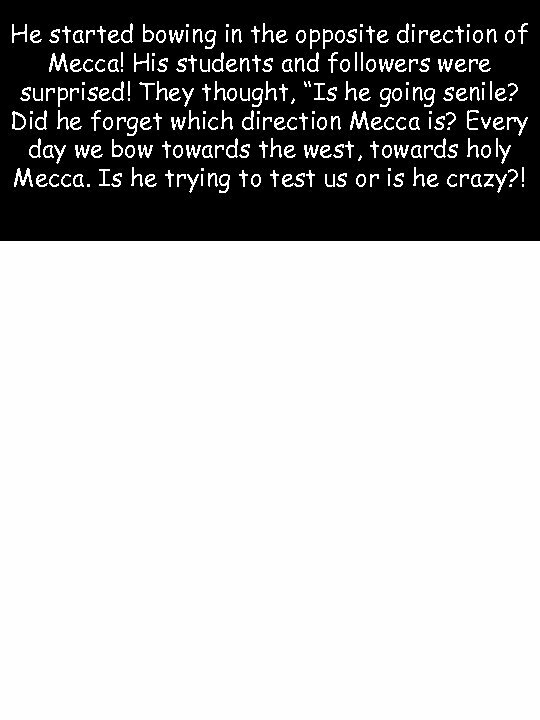 Did he forget which direction Mecca is? Every day we bow towards the west, towards holy Mecca. Is he trying to test us or is he crazy? ! He found out that in the Guru’s house, a child had been born to Guru Teg Bahadur, the holder of the throne of Guru Nanak. The boy’s name was Gobind Rai. Bhikan Shah made the journey to Patna. 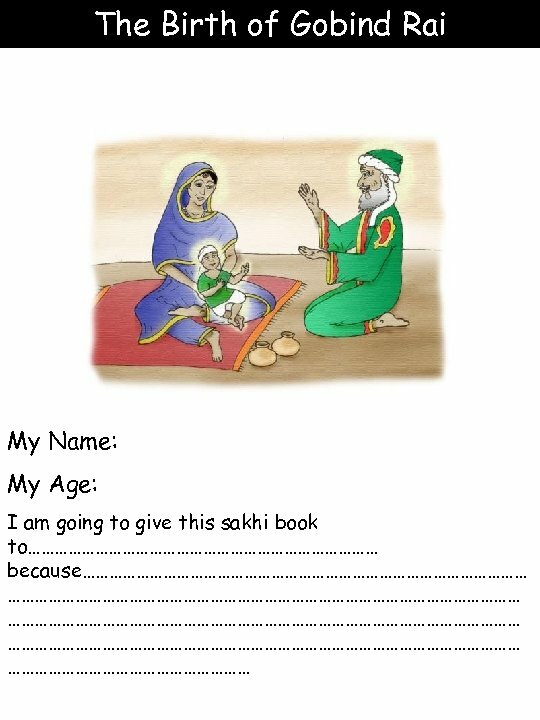 When he got to the Guru’s house he asked if he could come in to see the child. When he met with the baby. The old man and the infant seemed to recognize each other. Bhikan Shah placed the two pots in front of Gobind Rai, With his playful spirit, he reached out both hands and put one on each pot. Bhikan Shah became very happy and left the house of the Guru in good spirits. The relatives of the Guru and the Sikhs asked him what this funny scene was about. 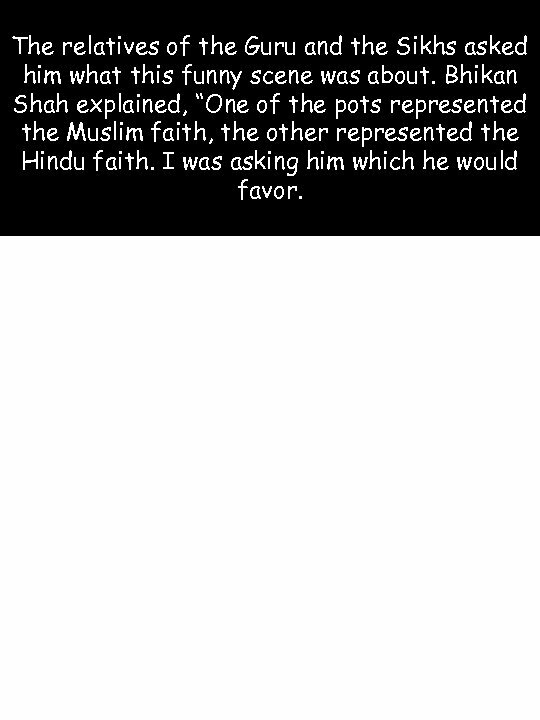 Bhikan Shah explained, “One of the pots represented the Muslim faith, the other represented the Hindu faith. I was asking him which he would favor. Naturally he chose both. Which means he favors all people and all religions. This divine blessed soul will be the protector of all humanity. ” And so it was that Guru Gobind Singh defended all people against those who wanted to attack them, and he set up the universal army of the Khalsa that will always protect all of humanity. Question Time 1. 2. 3. 4. 5. How does this sakhi make you feel? Why did the Guru choose both pots? What did you learn? What was the moral? What’s your favourite part? Who are you going to tell this sakhi to?